What Should You Do Right After a Car Accident in Pennsylvania? Car accidents are, hopefully, rare events in our lives. We may be so caught off-guard by a crash and feel so shaken-up that we’re not sure what to do first after an accident. However, the actions you take at an accident site can make or break a claim for damages you file down the road, so it’s important to handle these moments carefully. Below, you’ll find a few simple steps to take after a car accident in Philadelphia. If you have additional questions about what to do after a crash, contact a seasoned Chestnut Hill personal injury lawyer at Benedum Law. Check for injuries. Before anything else, check your car as well as that of the other driver to find out if anyone has been injured in the crash. Call for emergency medical attention if anyone appears to be hurt, and render any aid you can to other drivers or pedestrians involved in the crash. Even if you aren’t sure you’ve been injured, it’s a good idea to see your doctor after an accident for an examination, since you may have suffered injuries that don’t show immediate or obvious symptoms. Call the police in the event of a serious crash. 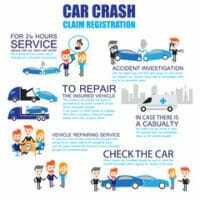 In Pennsylvania, individuals involved in an accident are required to report the accident to police immediately when someone has been injured or killed in the crash, or when one or both of the cars involved in the crash are too damaged to drive away from the scene of the accident. In the event of this type of serious accident, the police will come and create a report. If neither of these things has occurred, then the drivers involved should file a police report after the fact, using an official Pennsylvania accident report form. Exchange information with the other driver. Pennsylvania law requires you to exchange personal identifying information, as well as insurance information, after an accident. Even if you’ve only caused property damage to an unoccupied car or structure, you’re required to leave a note at the scene of the accident with your contact information. Document the scene of the accident. If it’s safe, take photos of the position of the cars involved in the crash, the damage done to the cars involved, as well as any debris or skid marks left on the road. These photos can support an eventual claim for damages, providing lawyers and accident reconstruction experts with valuable information about the circumstances of the crash. Contact an attorney. A skilled Philadelphia personal injury attorney can help you by building and filing a claim for compensation on your behalf, allowing you to focus on your recovery instead of endless paperwork. For seasoned, skilled, and effective legal help after a Pennsylvania car accident, contact the Chestnut Hill offices of Benedum Law for a free consultation at 215-LAWSUIT.